The economic depression of the late 1920s/early 1930s forced the merger of the Cunard and White Star lines in June 1934. The new company had recovered enough by 1937 to place an order for their first ship since the amalgamation. With Cunards 31,938-ton Mauretania having been scrapped in 1935, the decision was taken to use that name for the new ship. The second Mauretania set out on her maiden voyage from Liverpool - New York June 17th 1939. On her second return journey, she called at Southampton, Le Havre and London. Mauretania’s arrival at London saw her become the largest ship to have navigated the River Thames and use the Royal Docks. Just two months after Mauretania entered service, the outbreak of World War Two led to the British Admiralty requisitioning her to serve as a troopship. Mauretania’s first assignments were to transport troops between Australia, Suez, India and Singapore. The final year of the war saw her used to transport US troops to the war in Europe. 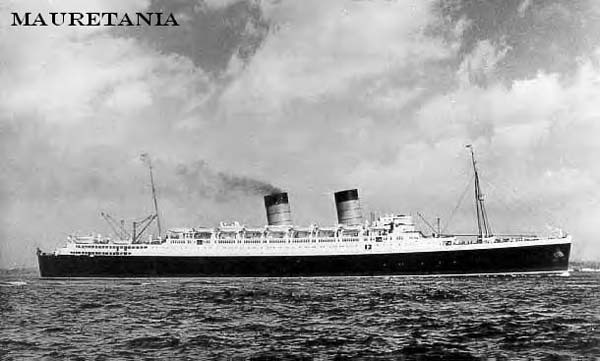 After completing her repatriation duties, Mauretania was returned to the Cunard/White Star Line October 2nd 1946. She then had to have her interiors restored before returning to the Atlantic run April 26th 1947, two months before Cunard took full control of the White Star Line. Due to the ever-decreasing amount of passengers crossing the Atlantic by liner, in 1962, Cunard had Mauretania’s hull painted light green before operating her as a full time cruise ship. These cruises were normally out of New York to various ports throughout the Mediterranean and Caribbean. Mauretania set out on her final cruise from New York - Mediterranean September 15th 1965. She arrived back at Southampton for the last time November 10th 1965 and set out for the scrap yards at Inverkeithing/Scotland 12 days later.